Springfield, Massachusetts, an economically and ethnically diverse city, is home to a variety of factories and corporations. At the turn of the twentieth century Springfield became a hub for the immigration surge Europe, creating new labor pool. According to the 1920 census, the “Springfield area,” the city and its suburbs, included 332,762 inhabitants. 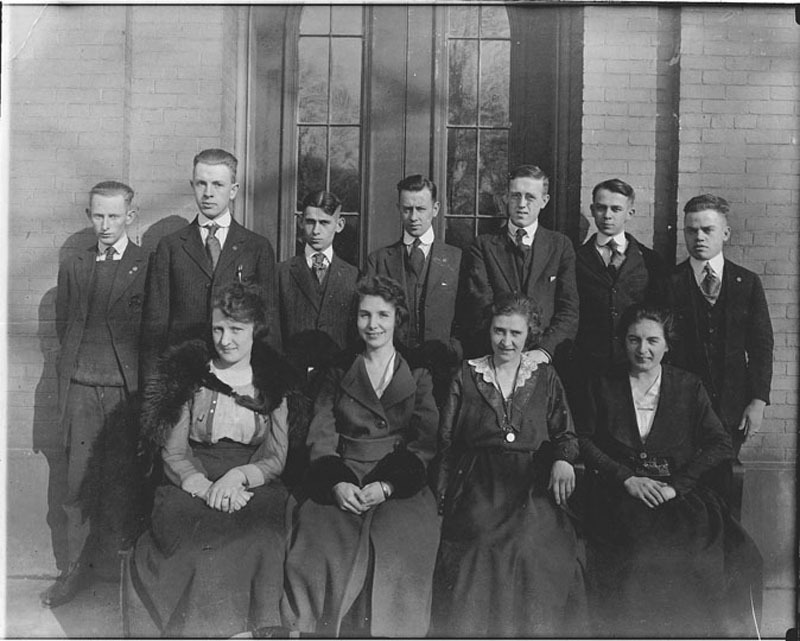 Nearly one fourth were foreign born and about sixty percent were either immigrants or their children.1 One of the most prominent employers in Springfield was the Armory, a diverse workplace that employed native born workers, immigrants, and women. Starting with World War One, the Armory started hiring women to help with the war effort. This proved beneficial to women because it gave them a push towards independence. During the war hundreds of women worked at the Armory and depended upon that income to sustain their families. When the war ended, the men came back to Springfield, forcing women to leave their jobs depriving them of the income and independence that they had worked so hard to sustain in and outside the workforce. Women in the work place struggled against much adversity, fighting for a safer work place. Female Armory workers made the connection between quality working conditions and productivity. The Armory provided women with a ten-minute rest period every morning and afternoon; an accommodation not made for men. 2 In January of 1918, the Armory provided women with new restrooms. The January 1918 edition of The Springfield Armorer reports that this was due to “the ever increasing number of Uncle Sam’s women workers.” 3 Such patriotic wording towards women shows an increasing level of respect that the women earned through the years. On January 14, 1919, The Armory fired five hundred employees, returning the workforce to prewar levels of about 2700 employees. This resulted in the firing of most married female employees whose husbands worked. 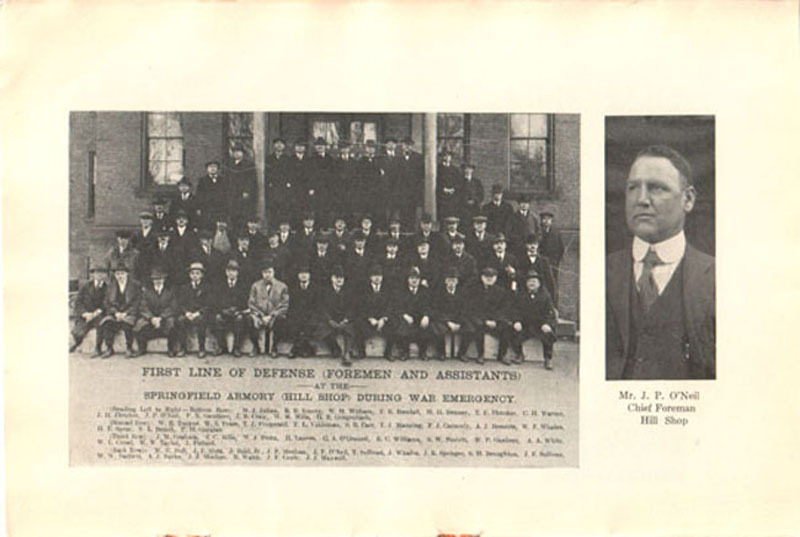 One of the heads of the Armory, Col. L. D. Hubbell reported to the press that after the January firing, he “is employing returning soldiers wherever possible.” 4 This happened at a time when thousands of American men returned from World War One and needed employment to sustain their families. Col. Hubbell, a soldier himself, perhaps sympathized with the returning G.I.’s and wanted to offer them Armory positions. He did not seem to sympathize with the hundreds of women he fired, believing that their fathers and husbands would provide for them. "The First Line of Defense: Foremen and Assistants"
Children represented the biggest responsibility for the women of Springfield. According to the 1920 census, out of the 9,061 foreign born women with children, 6,426 of them have children under the age of five 5. This great responsibility put many local women in compromising positions. In the early twentieth century, Springfield was nicknamed the “industrial beehive of Massachusetts”, a tribute to the diverse range of industries in the region. 6 This volume provided more opportunities for the women of Springfield. Some of the other factories included were the Diamond Match Company, The Rolls-Royce factory, and Milton Bradley. 7 Many women also worked as domestic servants or did in home piece work to sustain an extra income. Returning soldiers did not numerously replace clerical workers at the armory, allowing those women to keep their jobs when many women on the factory floor received termination notices. “Clerical work held little interest for returning soldiers or for men who had passed the last two years earning fabulous wages in the munitions plants, and so the need for female clerks remained.” 8 Secretary work, once a male dominated job, rapidly evolved into a female associated job around 1914.9 Women took on secretary work or “low level office jobs” and were rarely promoted. Men managed women in the office to play into the same domestic role they served at home, sometimes referring to them as “office wives.” 10 Secretary work was seen as proper employment for women at the time, especially for the young career girl just gaining her independence and looking for a respectable job that earned decent wages. 2 “Women Factory Workers in the First World War” . 3 “Ladies Restrooms”, the Armorer, January 1918, Vol.1 No.2 Pg. 7. 4 “Springfield Armory to Discharge 500 Today,” Boston Daily Globe, 14 January 1919. 5 Warren S. Thompson, “Ratio of Children to Women. 1920 Census,” U.S Government, 1931, 204-205. 6 Donald J. D’Amato, Springfield-350 Years A Pictorial History, (Virginia: The Donning Company, 1985), 139. 7 Donald J. D’Amato, Springfield-350 Years A Pictorial History, (Virginia: The Donning Company, 1975), 140. 8 Carrie Brown, “Demobilized,” (July 2005) www.rosiesmom.com (accessed 30 October 2006). 9 Gregory Anderson, “The White Blouse Revolution,” (Manchester University Press, 1988), 11. 10 Gregory Anderson, “The White Blouse Revolution,” (Manchester University Press, 1988), 16.